Montreal will soon be joining the list of cities that integrate bicycles as a form of public transportation. This fall, the city's new Public Bike System will be stationing a pilot fleet of 30 rental bicycles in the city's major boroughs, to gauge public interest and get ready for a full roll-out next spring. 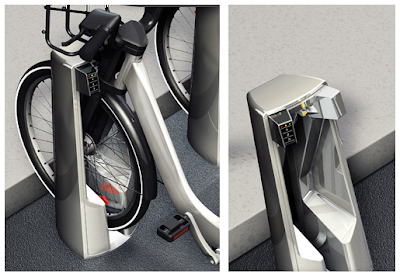 Ultimately, the city plans to make 2400 bikes available at 300 pick-up points. 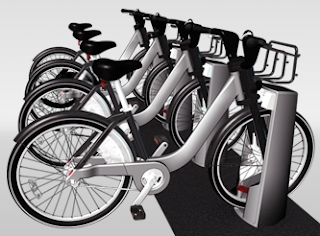 Bikes will be available for rent on-the-spot using an ATM-style arrangement: swipe your card to reserve and unlock a bike. Although efforts at city-wide bicycle rentals have failed in the past, this was mostly due to the non-automated, unlocked set-up of those systems: basically, every bike got stolen. But the new wave of fully automated systems have combined convenience and security, with the result that these new rental programs have become wildly popular. Some other cities doing bike rental programs include Sao Paolo, Paris, Lyon, and Barcelona. A totally private venture is also testing the concept in Washington DC.